» admin Make The Things! 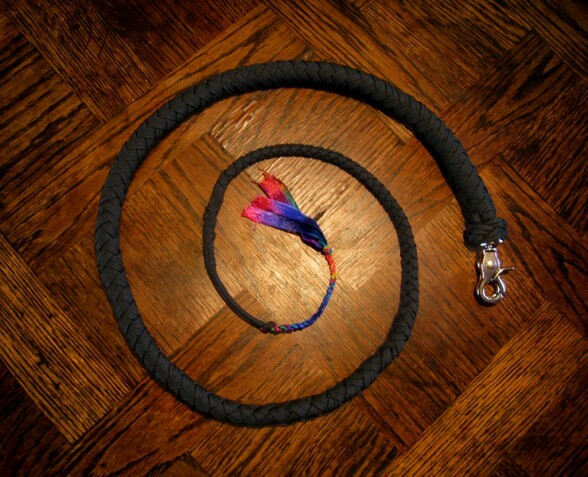 How to make a 4 foot snakewhip out of paracord. Before you start, remember to always wear eye protection when using your whip, unless you’re this guy. 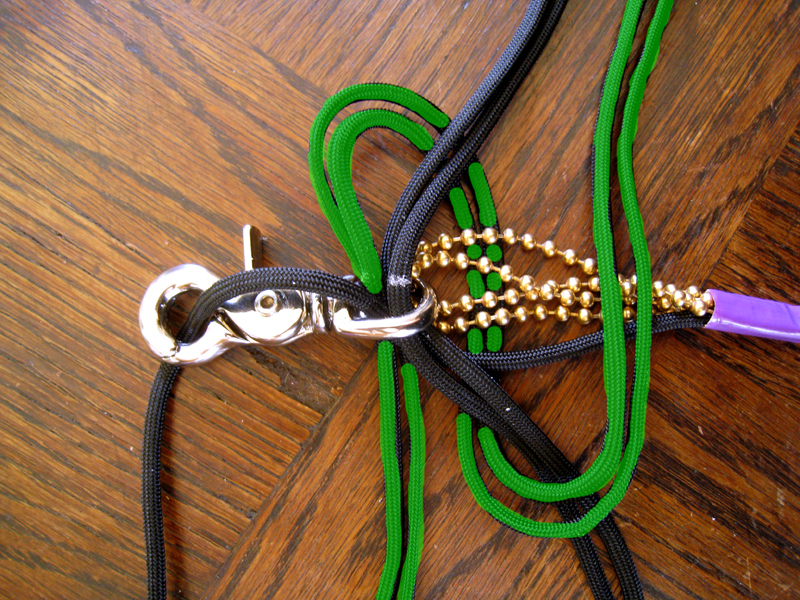 The design was loosely inspired by this instructable and takes around 6-8 hours. 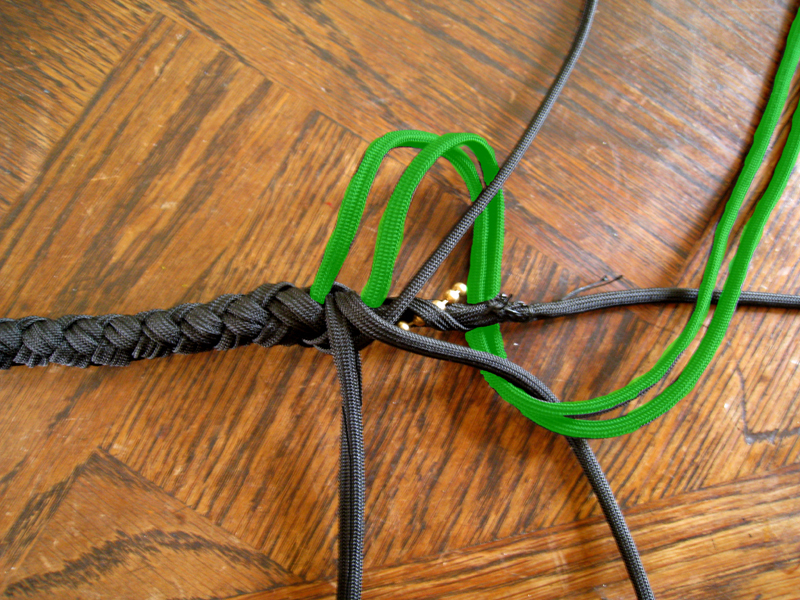 I also sell premade whips in any combination of colors. I currently have black, red, hot pink, and neon yellow in stock. Please specify colors and cracker color. Cut 33 inches (84 cm) of lamp chain. Mark with a sharpie 14 inches (35.5 cm) from one end. Cut 13 inches (33 cm) of lamp chain. Mark with a sharpie 4 inches (10 cm) from one end. 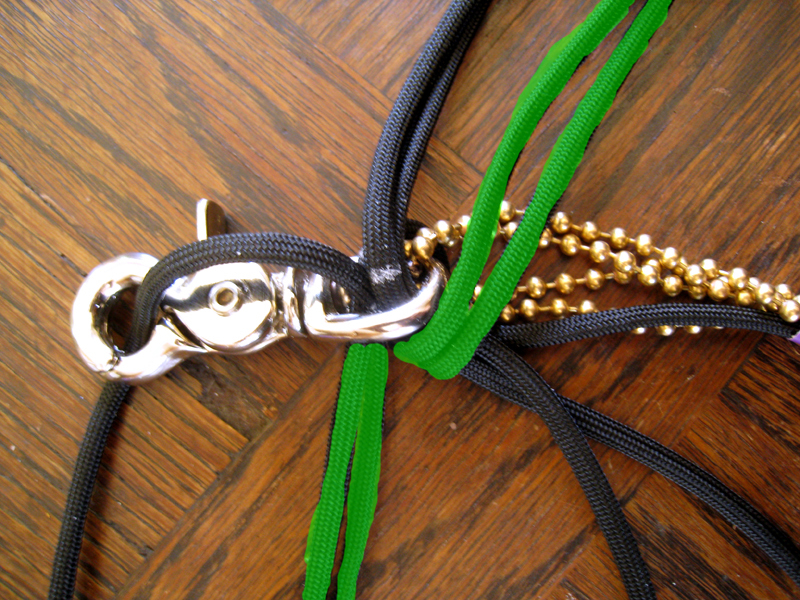 Cut 96 inches (244 cm) of paracord. Singe both ends. Mark in the middle with crayon. 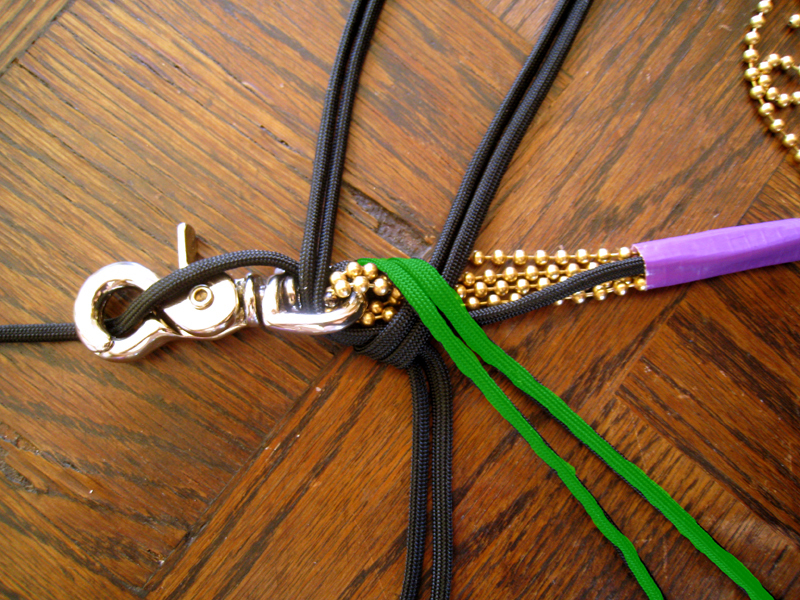 Thread paracord through the clasp so the mark touches the clasp and one end is loose. Tape everything in place so it doesn’t slip. 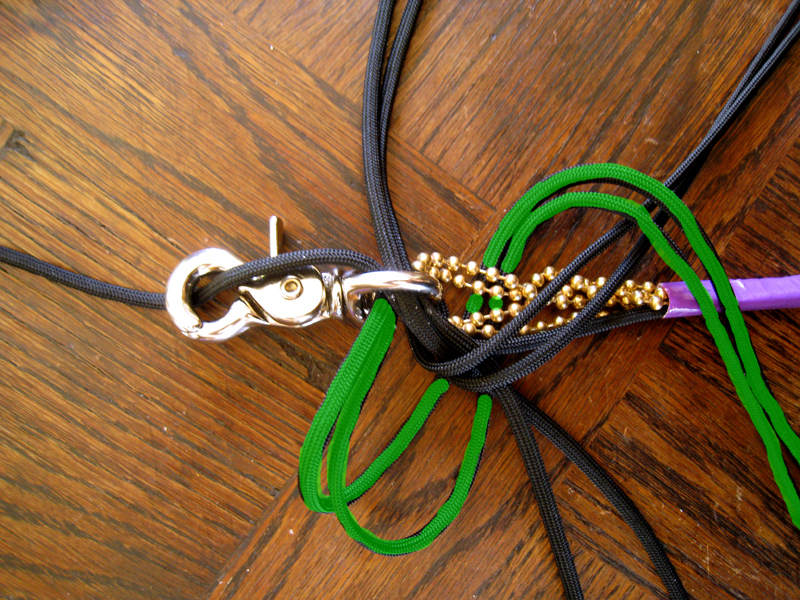 Put the loose end of the paracord through the other end of the clasp so it is out of the way. 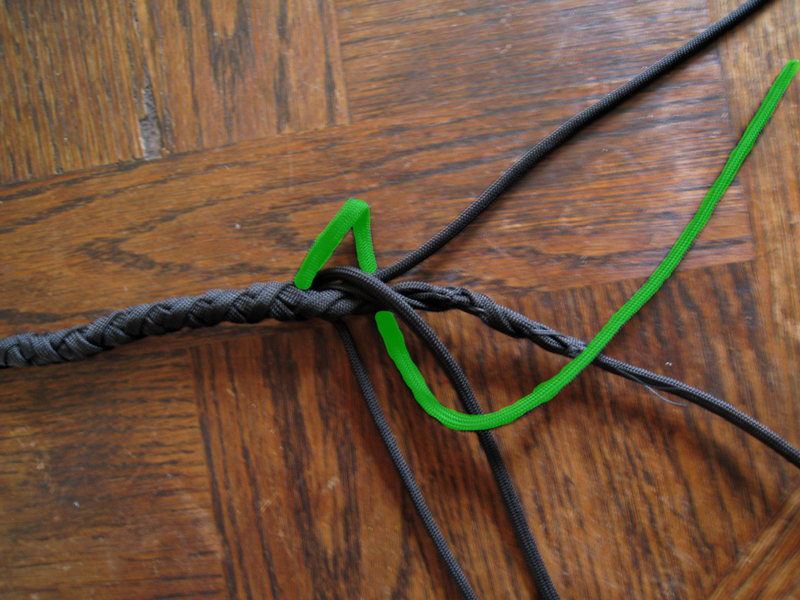 Cut 4 pieces of paracord: 99, 99, 85, 60 inches (252, 252, 216, 152 cm). Remove the cores (white strands in the middle). Singe the ends. Mark each piece in the middle. 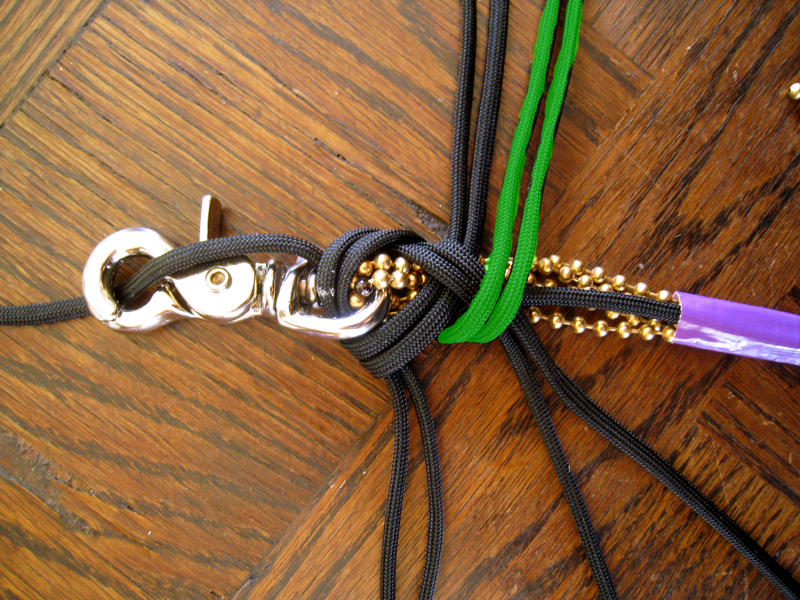 Thread 4 pieces through the clasp so the marks are touching the clasp. Position the 4 pieces as shown above. 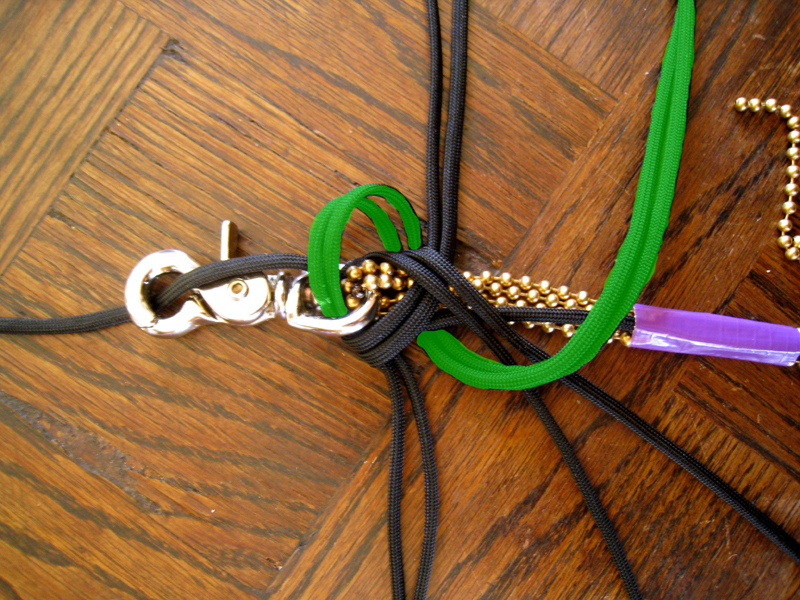 First strand of the braid. 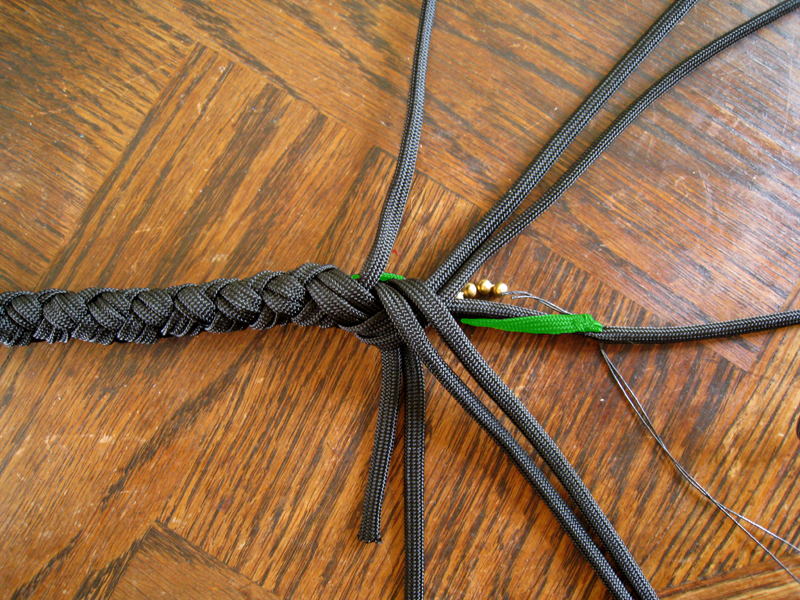 Continue braiding. 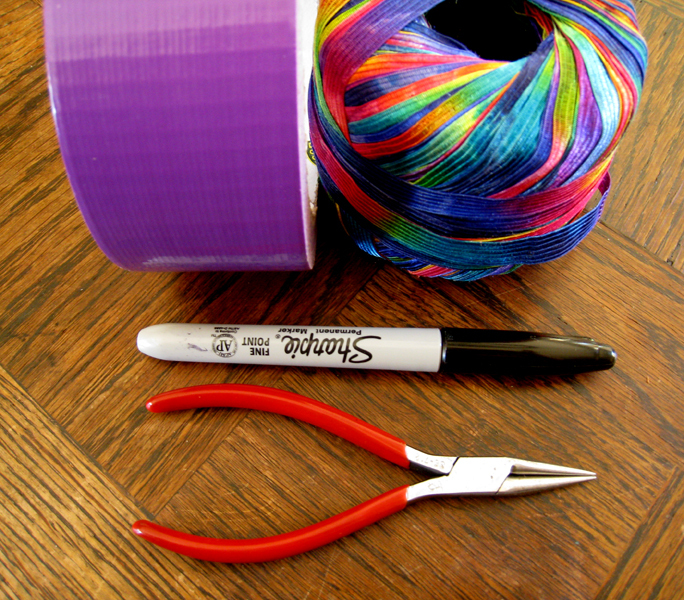 Remove the tape as you get to it. 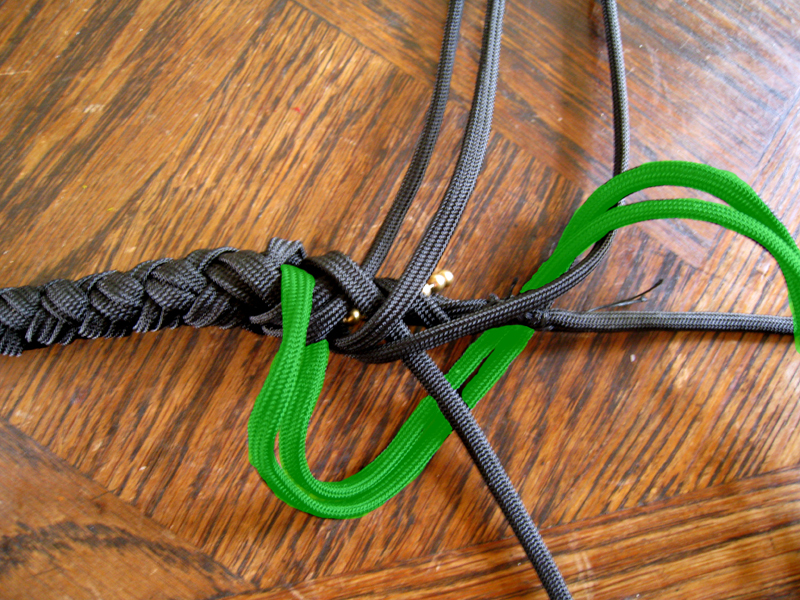 Be careful not to pick up the core strand of paracord and braid with that. 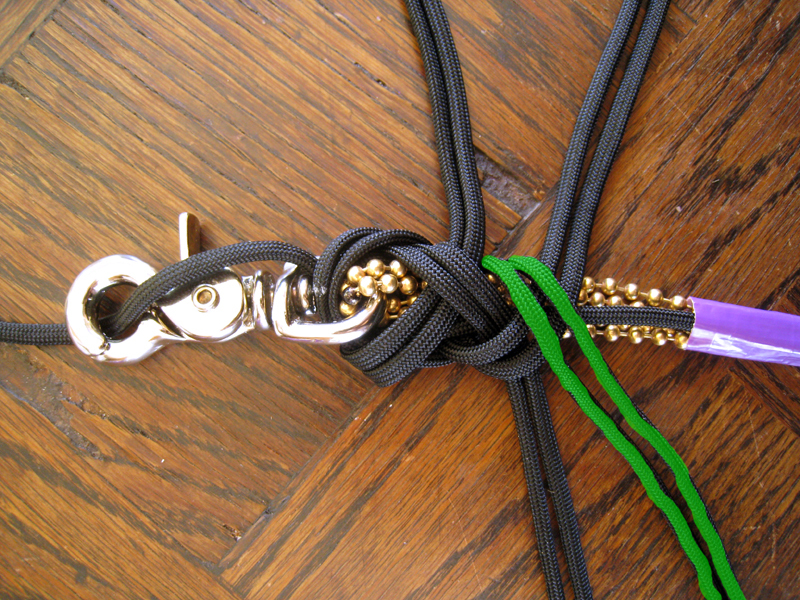 Every two strands, pull everything tight with pliers. The tighter the better. 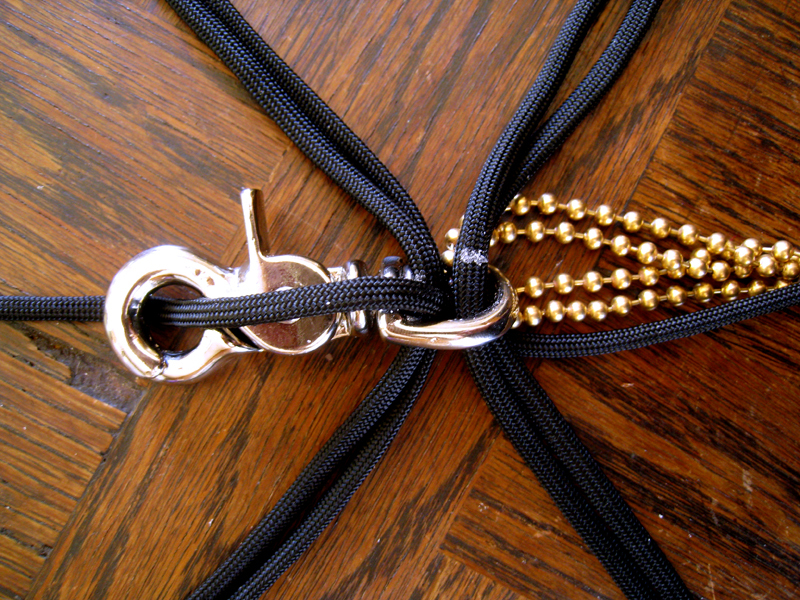 When one of the strands gets 1-2 inches (3-5 cm) in length, tuck it behind and wrap it around the core. Stitch it in place with the needle and thread. Repeat with the other short strand. 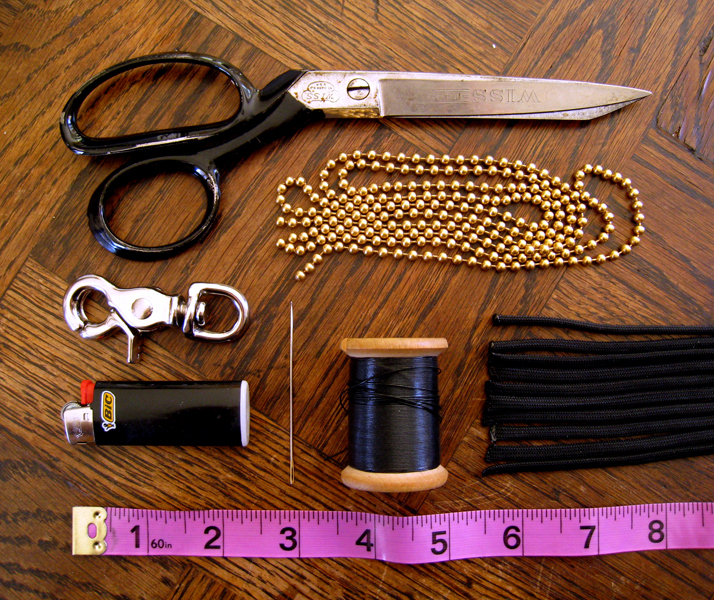 When the strands get short again, tuck them back and stitch in place again. 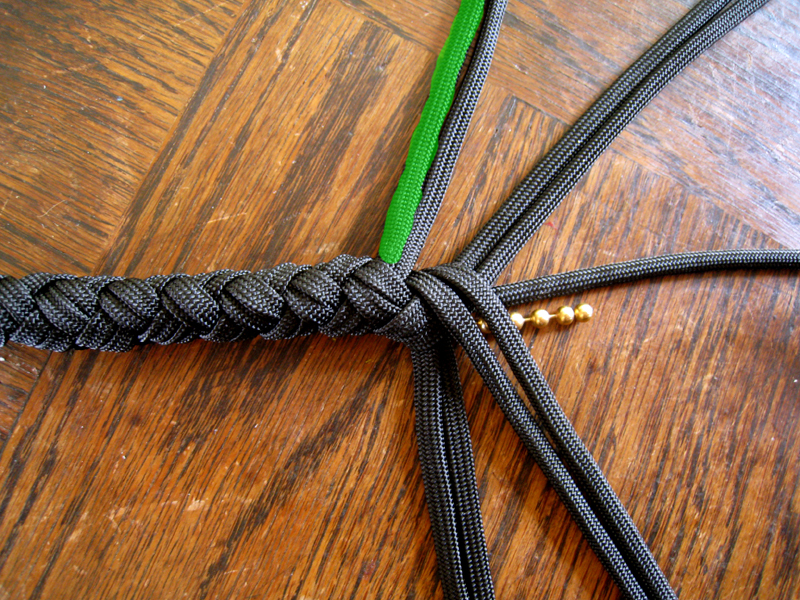 Continue braiding with 4 strands. When you get to the ends, tuck back and stitch in place. 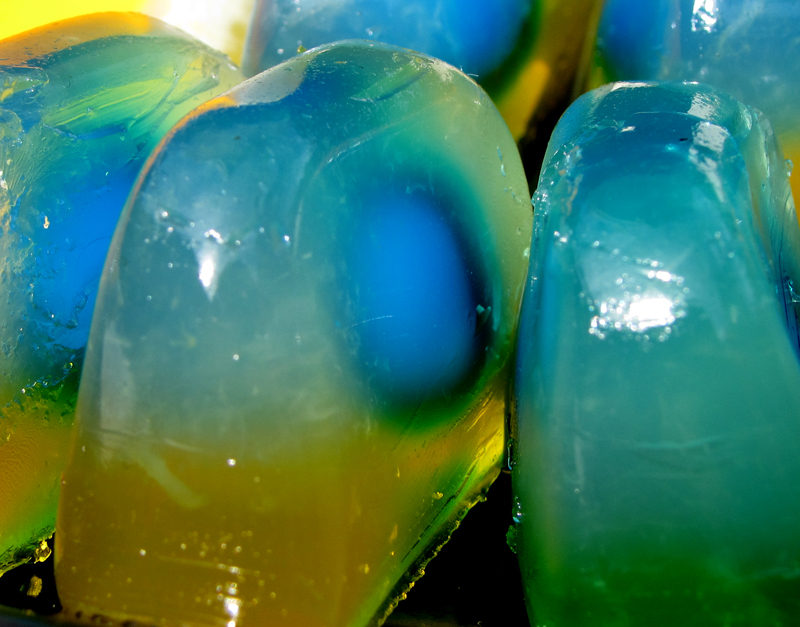 These are the first jello shots I ever made. 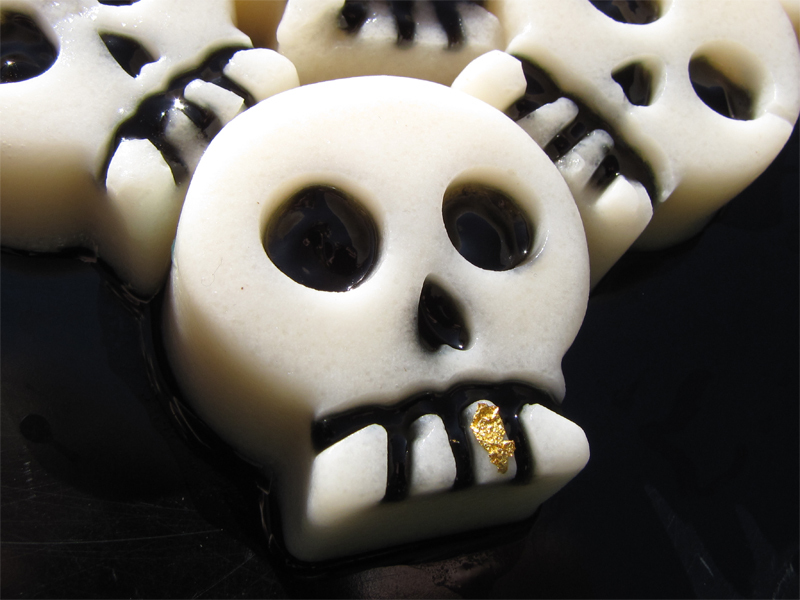 Rum and coconut skulls. 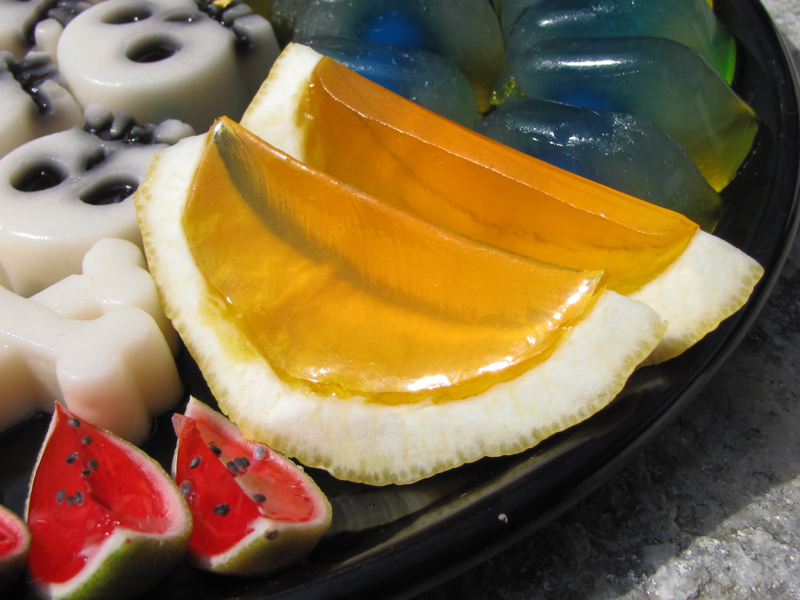 They use agar agar instead of gelatin which means they stay solid at room temperature, are vegan, don’t stick to silicone molds, and have a very interesting texture. Because of the low melting temperature, the liquid starts to solidify shortly after it’s taken off the heat, so you have to work fast. This is attempt two at Key Lime Pie Jello Shots. 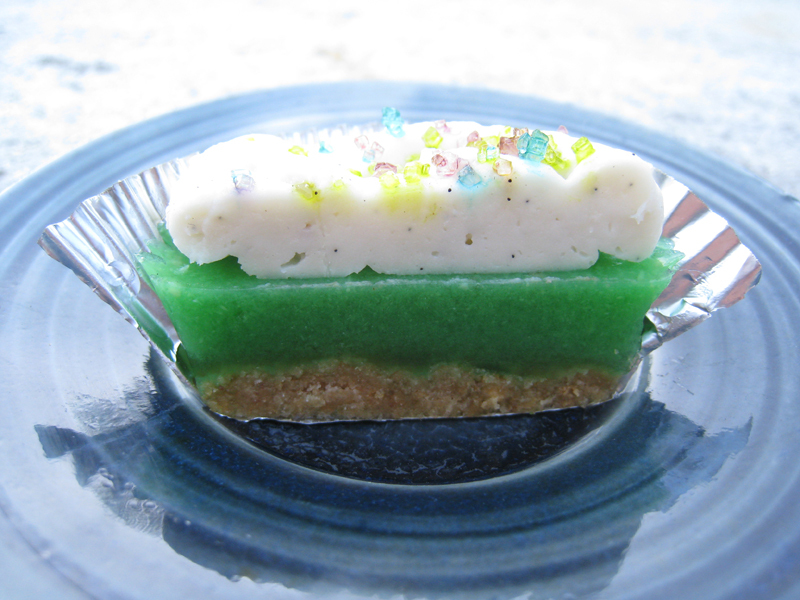 The first batch was composed to Key Lime juice and sweetened condensed milk, and was rather tart. This time around I added a whipped topping and colored sugar. The flavor is perfect. The tinfoil baking cups worked out great. 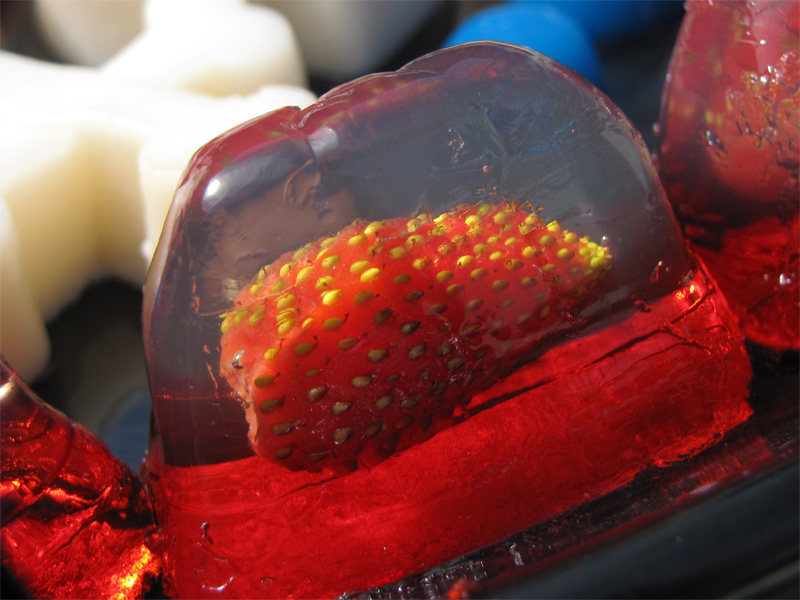 The jello did not leak or stick to the foil. Why do I do this?! Why make something so needlessly complicated?! These are based off my Indian Chai recipe (which I may post later). 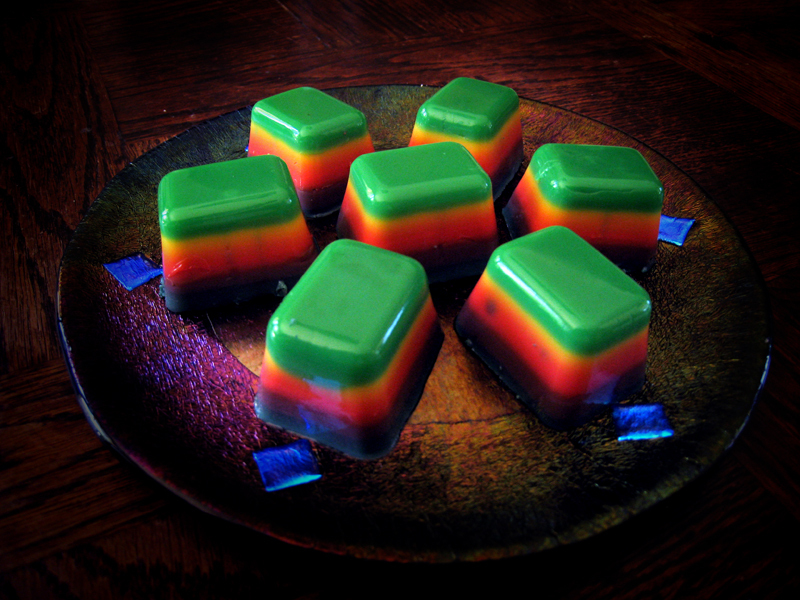 They actually taste exactly like chai tea, despite their disturbing rainbow appearance. 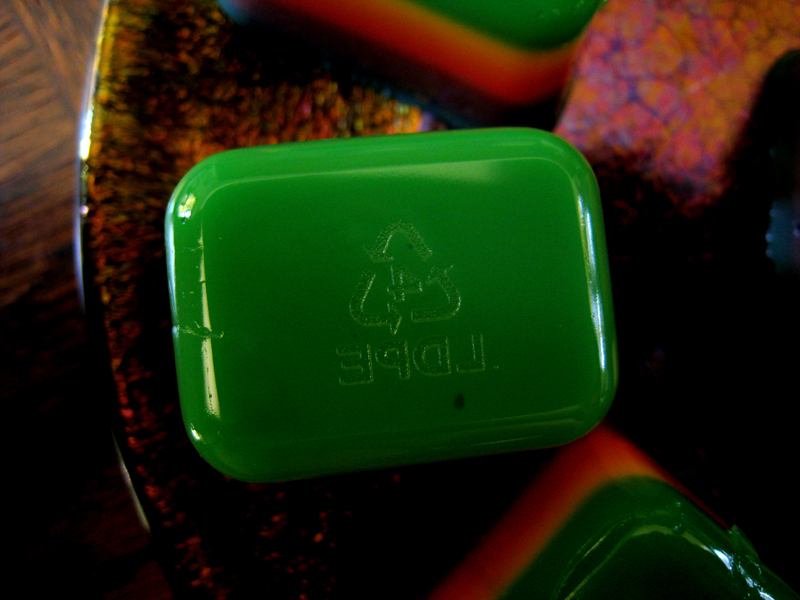 It turns out my ice cube tray has a recycle symbol on the bottom of one of the sections. Do not want to think about how these can be recycled. 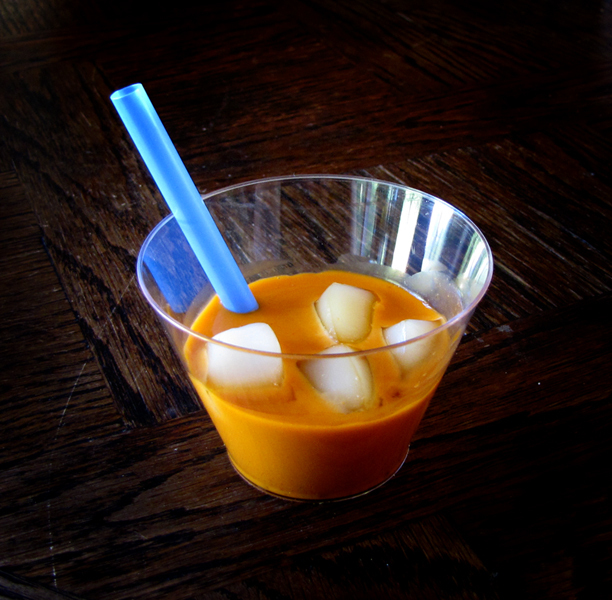 Thai iced tea is one of my favorite drinks. 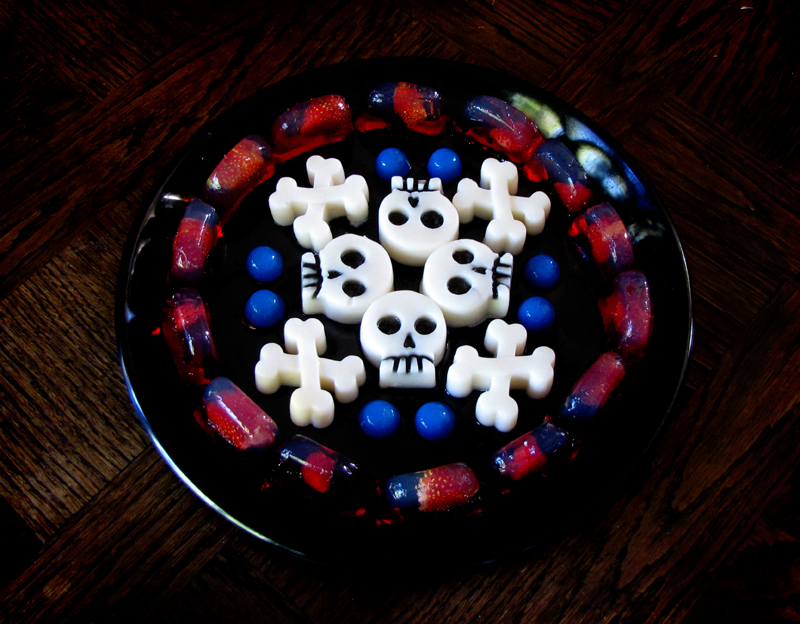 I wanted to see if I could make a jello shot variant. The ice cubes started out white and became completely clear by the next day. The ice cubes were poured into a flat pan and cut up after they set. 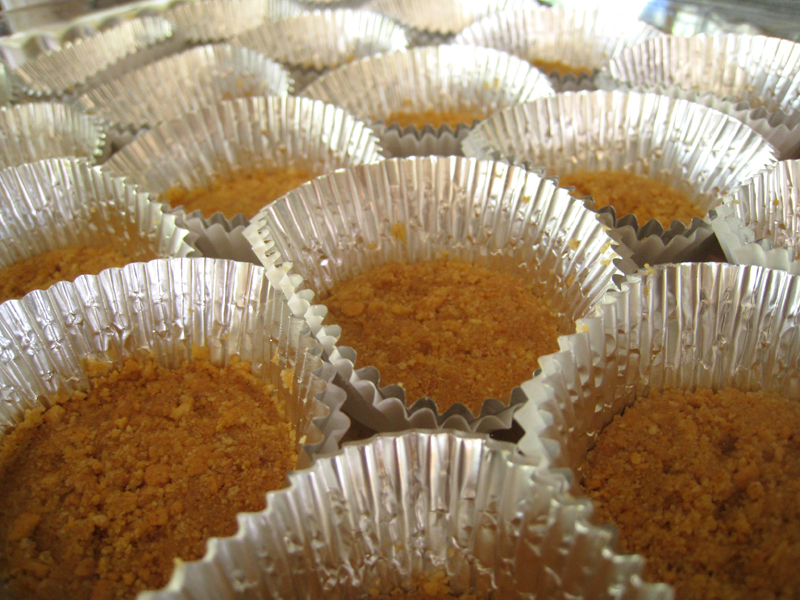 I then put them in the freezer to harden and added them to the thai tea once it was almost completely set. The thai tea was made by simmering a lot of loose Thai tea leaves in water then straining it. This was incredibly delicious and I am sure to make other tea variants in the future. 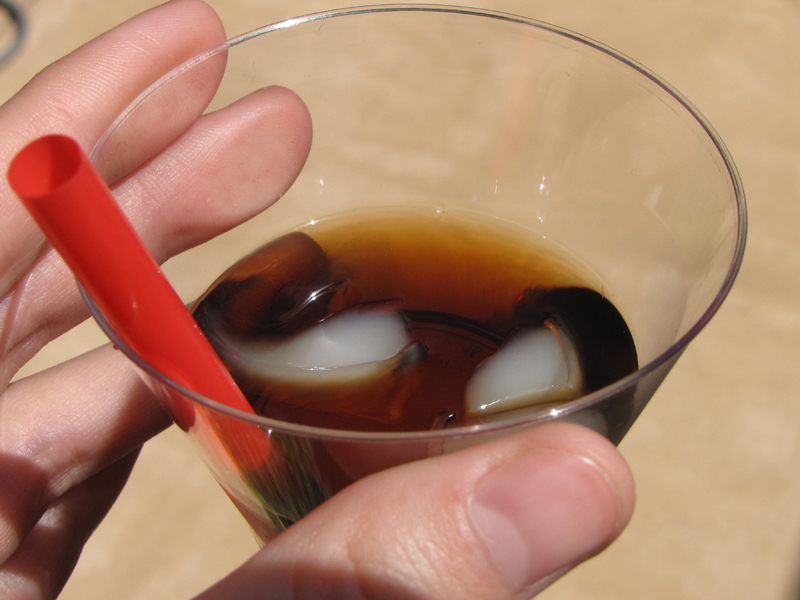 The Rum and Coke was actually pretty gross. The difference between drinking Coke and eating Jello Coke is quite profound. It is easier for our taste buds to absorb a liquid than a solid-ish mass. The result was bland and flavorless. It would have been improved by using Coke syrup or something more concentrated. Also, Diet Coke was a mistake. 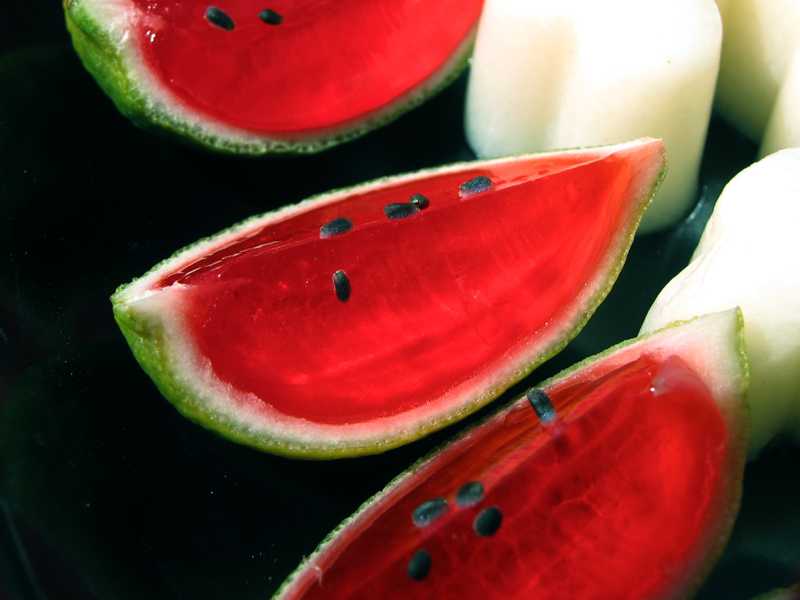 These are Strawberry Daquiri jello inside tiny key lime rinds. Unless you are a masochist who likes tedious tasks, use a reasonably sized lime. Seriously. What is wrong with me? The clear top is Rosewater and rum. It was a bit too bitter, so I would recommend adding Agave Nectar or sugar. Those are organic Alpine and Sequoia Strawberries from my garden. You could use any kind of berry. 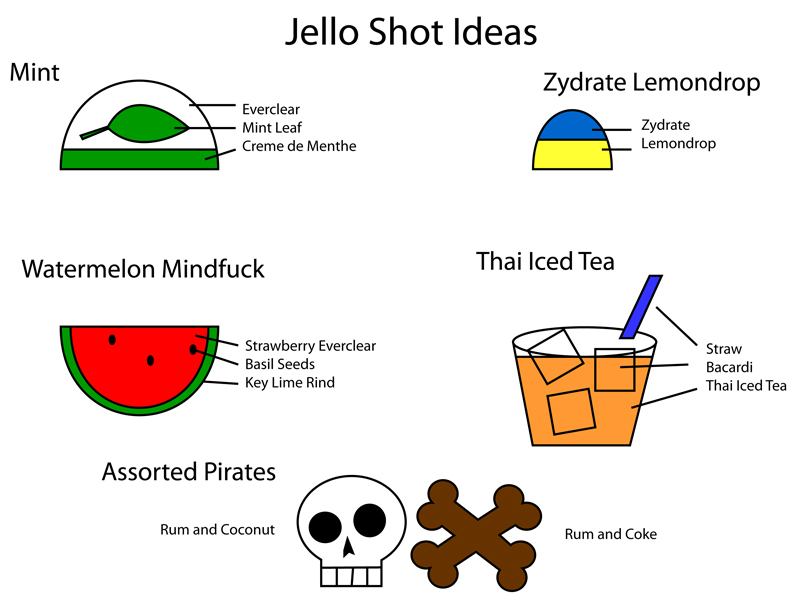 These are based on a friend’s 136 proof mixed drink recipe called Zydrate, Blue Stuff, or Windex. The jello shots contained no water at all, so I estimate they were around 130 proof. I simmered unflavored gelatin in the ingredient with the lowest proof with the lid on the pan to keep the alcohol evaporation to a minimum. After that I embed some into some lemon shots to create a Zydrate Lemondrop. 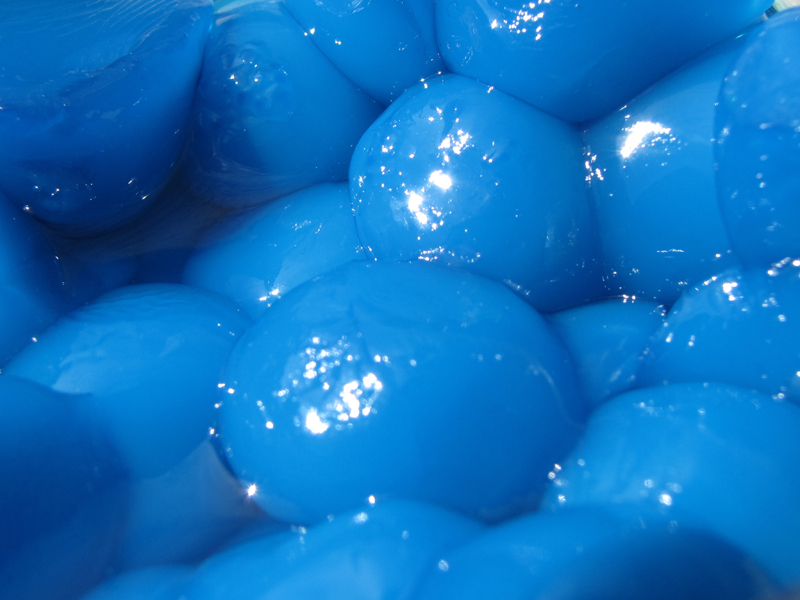 The smurf eggs were put into the freezer so they wouldn’t melt when added to the lemondrop. The Lemondrop was poured into an ice cube tray. Once it had almost set, smurf eggs were added. This was allowed to set in the fridge, then Limoncello was added on top. I had some left over lemon rinds so poured the extra Limoncello into them.